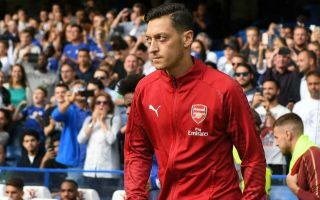 Arsenal legend Emmanuel Petit has sent a strong message to manager Unai Emery about what to do with Mesut Ozil. The Spanish tactician notably benched Ozil in the win over Bournemouth last weekend, and didn’t even bring him on as a substitute at any point. This would have been almost unthinkable under Emery’s predecessor Arsene Wenger, but Petit has suggested he thinks the new boss has made the right decision. Speaking in an interview with the Independent.ie, the Frenchman also explained that he believes Ozil needs to step up before he can be included in the team again. In a strongly-worded interview, Petit said he didn’t care about Ozil’s reputation or how much money he earns, but called on the German playmaker to start influencing big games more. “Ozil at his best is worthy of a place in most teams, but when was he last at his best?” the former Gunner said. “As a play maker, he has some very good qualities, but are we talking about the form of the player or the name and reputation of Ozil? “Sometimes, it feels like we are looking at him as a great player because of his performances two or three years ago, but that doesn’t matter now. “This is why I was happy to see Emery leave him out at Bournemouth. He is picking the best team to win that game and not looking to keep a big ego in his dressing room happy. “He dealt with enough egos during his last two years at Paris Saint-Germain to last him a lifetime and that cannot have been enjoyable, but Emery is at a club now that will allow him to follow his own path and it means every player needs to step up. Many Arsenal fans would probably share the view that, despite his talents, Ozil doesn’t quite do enough when it matters most to necessarily justify being one of the first names on the team sheet. At the same time, however, Emery does not have a huge amount in the way of alternatives, so may not want to be too hard on a talent like Ozil, who has produced plenty of world class moments in his time at the Emirates Stadium.